Died: 9th March 1924, North Berwick. BEN SAYERS born 23rd June 1856 at 8, Fox Lane, Leith, son of Christopher Sayers, basket-maker and his wife Agnes McEvoy, the daughter of Bernard McEvoy a hand loom weaver from Rathfriland, Northern Ireland. At the age of eleven Ben Sayers moved with his parents to Market Street, Haddington where his uncle John McEvoy gave him a golf club, but so little did he know of it's use that he shortened it, by cutting a length off the leather grip. The young Sayers learned to play his golf by knocking about stones through the Haddington streets. The family returned to Leith in 1870 and were living at 19 Silverfield when 14 year old Sayers was described as a 'Golf Boy' on Leith Links. Ben was also a professional acrobat until the age of sixteen when he took up golf more seriously. Within two years he gained a fourth place in a professional tournament in Glasgow. He later won first prize in competitions at Dunbar, Kinghorn, Archerfield and Hoylake. During this period Ben was listed as a 'Golf Ball Maker' living adjacent to Leith Links at 7, Bath Street. He moved to 8, Burns Street where he shared an apartment with Davie Grant and Isabella Thomson. Ben Sayers credited his school friend James Kay as the person who taught him to play golf. Kay (b.1854) lived at 4, Burns Street, Leith and was appointed pro at Seaton Carew (1886-1927). In 1876, Sayers gained a reputation for making a golf ball that bounced well. He experiment with filing down rubber and mixing it with gutta percha in an ordinary mould. Two years later Sayers entered the Open Championship at Prestwick from Leith. In 1879, he entered the Open from North Berwick and that year married local girl, Catherine Thomson. His best-man at the wedding was Charlie Gibson a club maker with Tom Dunn at North Berwick. Catherine was part of the Thomson golfing dynasty, her sister Isabella married Davie Grant and their brother was Wilfred Thomson. The eldest sister Emily Thomson married James White and their son Jack White won the 1904 Open Championship. The Thomson girls refused to leave North Berwick and they all remained at home. In 1879, Ben Sayers followed Matthew Allan from Prestwick as professional at Worcestershire Golf Club at Malvern. According to the golf historian Robert H.K. Browning, Sayers only lasted a month before he returned to North Berwick. In 1880, 1881 and 1882, Sayers entered from Musselburgh, and in 1881 he was among the 22 starters at Prestwick, but withdrew when a violet storm blow up and only eight finished. In 1883 Sayers entered the Championship from his permanent base in a row of pantiled cottages at 41 Westgate, North Berwick. "Ben Sayers was a pioneer in leading his fellow pro's by example to acquire a new respectability." Ben's son George recalled how as a toddler he met his first golf ball in the kitchen of their home in Westgate. His mother had the dual job of raising four children and making golf balls for his father's business. At that time there was only one employee - his mother. She turned out 12 dozen balls a day. George Sayers said he could remember his mother taking the round gutta-percha rods, 4 feet long, 1 1/2 inches in diameter, marking them with a gauge and cutting them on the guillotine. Each piece was to weigh slightly more than 28 penny weights. Balls those days weighed 26 1/2 to 28 p.w. His father carried them in all weights in his pockets while playing. He used a heavy ball against the wind and a lighter one with the wind. James Law, a proprietor of the Scotsman newspaper, rented Archerfield House in the summer months, and was one of Ben Sayers first pupils. He took a great interest in the young Sayers, and when Davie Strath died and his mould and ballmaking machine came up for auction, James Law bought it for Sayers along with £100 of best gutta percha. It has been said that Ben Sayers owed much of his success in life to James Law. In May 1886 when Ben Sayers enrolled his daughter Blanche into the North Berwick Public School, he described himself as a ballmaker. During this period he made the marks on the outer cover of the balls with a hand-held mechanical cutting machine resembling a carpenter's plane. This produced lines that were parallel, straight and fine. Sayers had a reputation for making good quality gutta percha golf balls which were sold by Thornton & Co., Edinburgh. 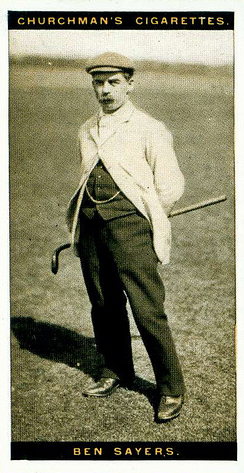 Ben's brother George Sayers was pro at Beverley and East Riding Golf Club in 1891. Ben Sayers Snr. standing 5 feet 3 inches tall, won 24 tournaments, but was fated never to win the Open. In 1888 at St Andrews, Sayers tied with Jack Burns for the Championship on 172, and when it was found that Burns had scored 86 and not 87 in the first round, he was awarded the Open title. Sayers tied for second place with James Anderson on 172 and shared the £8 and £6 prize money. Jack Burns was unable to make the most of his talent and returned to caddying at St Andrews. On Friday 24th August 1888 Ben Sayers played Willie Park Jnr. in an exhibition match at North Berwick. Challenging the Open Champion was Sayers biggest contest to date. The town was busy with summer visitors eager to watch the professional competition. The first round started at 11am and after an evenly contested match by the time they reached Point Garry-In the champion was two up. Sayers won the last hole to reduce his lead to one-up. At the start of the afternoon round a large group of spectators had gathered round the first tee at 2.30pm. Sayers won the Perfection hole by 4 strokes to 5 and the game was again on level terms. They halved Redan but the champion won the next two holes and consequently won the match over the two rounds by two-up and one to play. At the close the ex-Provost Peter Brodie who was referee presented both winner and loser with a sum of money which he stated had been subscribed by visitors and others. At the request of the ex-Provost a subscription was also taken on behalf of the caddies. The newspaper report on the match included a reference to the new hole named 'Perfection' for the first time. When Tom Dunn the club-maker left North Berwick in 1889, Ben Sayers took over his formal duties and was paid ten shillings to be in attendance at the North Berwick New Club council meetings and to see the Tantallon members off the tee at the start of their medal rounds. At that time James H. Hutchison from Musselburgh took over the rent of the clubmakers workshop beside the first tee. Ben Sayers was granted a professional license on the West Links on 12th May 1891. 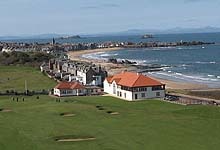 The North Berwick New Club did not retain a golf professional on the West Links until 1967. Ben Sayers was one of ten licensed golf professionals on the West Links, four playing with the members and six available to give lessons. Ben Sayers, Patent No. 24,473 - 1894. The specification consists of attaching a band or strip of rubber, cloth, leather or other material to the handle of each club in a slanting position, so as to form a loop into which the left hand passes to grip the club. By this means, the club cannot turn in the hand when making a stroke. In 1893 Sayers rented a shop at 102 High Street and the following year he moved with his family to an apartment above at 98 High Street. During this period Sayers used a gutty ball marker press made by J & A Bridges at their iron foundry on the East Bay, North Berwick. The press is now on display in the British Golf Museum. In 1894, Sayers constructed a timber workshop on the garden wall of Inchgarry House adjacent to the 18th tee on the West Links, where he had lockers for hire by the visitors, sold golf balls and repaired clubs until 1918 when it was taken down. The golfers could arrange for a lesson with Davie Grant in Sayers workshop which had a large framed picture of Old Tom Morris hanging on the wall and numerous photographs of the rich and famous on the West Links. Working from his small workshop Ben invented an approaching club which he named 'Benny' this happened just after the advent of the Haskell ball which everyone found so difficult to control over bunkers guarding the greens. His club was a great success and not long afterwards he invented another club which he named the 'jigger' this was a shallow-faced iron for a longer shot. In 1898 Sayers rented the property at 14 Quality Street, (above the Ship Inn) and that year Sayers described himself as a 'golf club manufacturer' for the first time. In 1910 Ben Sayers laid out a number of bunkers at Baberton Golf Club and in 1912 he opened a retail outlet at 21, Station Hill, North Berwick. James Hutchison the club-maker occupied the building next to the first tee until 1913 when his son-in-law Andrew Bisset continued the business until his death in 1917. As the hardship of WW1 began to bite and the club-makers were conscripted into the armed forces, the shop in Station Hill was closed and Sayers business moved to the vacant workshop on the West Links. At this time Ben Sayers lived in Abbotsville, 39 Dirleton Avenue, North Berwick. During the visit of King Edward VII to North Berwick in 1902 he watched the golfers playing 'Perfection' and the children on the Ladies course while he toured the town in an open top carriage with two horses. Ben Sayers was presented to his Majesty by Prince Edward of Saxe Weimar who hosted the King's visit and as such was later awarded the freedom of the Burgh. The King ordered a set of clubs from Sayers which included four woods and six iron clubs and in the afternoon Sayers played the West Links with the King's Equery. Sayers greatest strength was in match play, and his most historic match was in September 1891 when he and his brother-in-law, Davie Grant, played Hugh and Andrew Kirkaldy, a home and home foursome over North Berwick and St.Andrews. The brothers were at the height of their power and the two little men from North Berwick were thought to have been over-ambitious. Sayers used his Carruther's patent cleek to great effect off the tee and the North Berwick couple won so many holes over their own course as to demoralise their opponents the whole match ended 12 up with 11 to play. The referee at St Andrews was Old Tom Morris and at North Berwick it was Peter Brodie. The umpires were Col.Boyce and H.S.C. Everard. Among the gallery was the Chief Secretary for Ireland Arthur J. Balfour, (Prime Minister 1902-05), Horace G. Hutchinson, sports writer and Allan F. MacFie, the first Amateur Champion in 1885 and Davie Grant who had 2/6d on his brother-in-law to win. It was reported that during the match Ben Sayers and Hugh Kirkaldy had a violent altercation on a green as to whether a weed picked up by Sayers off the line of a long putt was growing, as the St. Andrews men asserted, or was lying on the ground when lifted. This was one of many arguments that made the golf of that period an exciting game for the gallery. In 1894, Sayers played another great home and home match - a single against Andrew Kirkaldy for £50-a-side. They played two rounds in the one day at North Berwick and two at St Andrews a few days later. The match at North Berwick was described as a bad tempered affair. Kirkaldy disgusted with his play gave his ball a bang from the 17th green and it ran right over the first green on to the shore. Sayers gained six holes at North Berwick, but Andrew's first round at St. Andrews was such a fine one that the six holes were reduced to a single one. In the afternoon that one disappeared also, and the match was square with five to go. Then Sayers did those last five in twenty strokes, tremendous golf with a gutty, and won the match by two holes. The umpire was Edward L. J Blyth and Sayers caddie for both matches was Big Henry Crawford. Sayers was a prominent book-keeper at important golfing events and backed himself heavily in the match against Kirkaldy. The railway station at North Berwick had a telegraph service and it was used to obtain the news of this celebrated match from St Andrews. 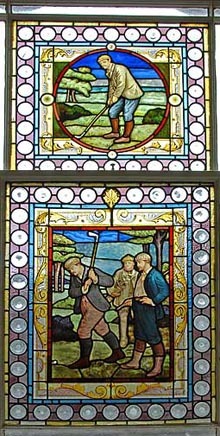 Ben Sayers and the Kirkaldy brothers are featured on a stained-glass window in the Braid Hills Hotel, Edinburgh. The Hotel was originally a Golf Room erected to serve the golfers playing the new Braid Hills golf course. The Room was fitted with 150 boxes for rent at 7/6d per annum and two stained-glass windows, unveiled in October 1894. The artwork was carried out by Messrs Dobbie & Co, 86 Lothian Road, Edinburgh and the windows can still be seen today. 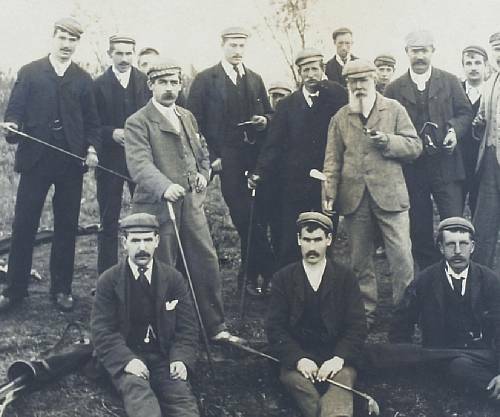 Ben won the stroke-play competition to mark the opening of Luffness New course in October 1894. He carded rounds of 84 and 82, for the wining total of 166 and £25 prize money. Davie Grant was second on 170 and Willie Auchterlonie, the Open Champion, tied with Andrew Kirkaldy for third place on 175. Old Tom Morris at the age of 73 years took part, playing over the course he laid out the previous year. The landowner Mr. H.W. Hope provided lunch for the competitors and a refreshment tent where the pros enjoyed a whisky or three. Sayers abstained from alcohol all his life. Hundreds of spectators travelled from North Berwick to watch the tournament in dog-carts and carriages of every description which were parked on the grass verge on the road to Aberlady. and Old Tom Morris in the middle. In 1906 Ben Sayers travelled to Dunbar to give lessons to the Duchess of Roxburghe and her mother Mrs Goelet. When the Duke of Roxburghe laid out a golf course in Floors Castle, Sayers would give lessons there. To celebrate the opening of the Cruden Bay Hotel and golf courses in 1899 the Great North of Scotland Railway Company organised an exhibition tournament played for by the leading golfers of the day. These included the inaugural winner Harry Vardon, as well as Ben Sayers, James Braid and Archie Simpson. Vardon received £120 prize money. In 1904 Sayers and Kirkaldy won the Professional Foursomes at Sandwich after an exciting final with James Sherlock and Rowland Jones. They successfully defended the title at St Andrews when they met Ray and Jones in the final. Despite their colourful matches, Sayers and Kirkaldy were formidable partners when they played for Scotland against England from 1903 to 1913, except 1911. Sayers also gave lessons to Her Majesty Queen Alexandra over the nine hole course at Windsor Castle. He gave instruction to the Prince of Wales, Princess Victoria, Duchess of Connaught and Princess Patricia of Connaught. Princess Victoria was a very keen golfer, and Sayers partnered her in several foursome matches at Chatsworth, home to the Duke and Duchess of Devonshire. During this period Edward VII visited the seven-hole course at Chatsworth for a week in January. A.J. Balfour the Prime Minister was among the guests and invited professionals included Jack White, J.H. Taylor and Ben Sayers.
" Sayers taught princes and nobles to play the game, was presented to King Edward, and received a presentation from King George, when Duke of York." It was in teaching the game that Ben Sayers was most influential with many of his pupils taking golf to all corners of the world including Robert Maxwell, Dorothy Campbell and Frenchman Arnaud Massy who became the first overseas player to win the British Open in 1907. 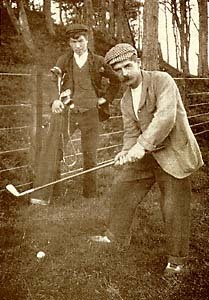 Ben's nephew, Jack White the professional at Sunningdale, won the British Open in 1904 and his brother-in-law David Grant, also originally from Leith, was a ballmaker at North Berwick. In 1908, Sayers reached the semi-final of the £400 matchplay tournament at Mid-Surrey. He beat Andrew Kirkaldy in a £100 match over North Berwick and St Andrews and again in 1911 over Suningdale and Walton Heath. Sayers beat Willie Campbell 6&5 in a £100 match over North Berwick and Prestwick. Seymour Dunn was born in North Berwick in 1882, son of Tom Dunn clubmaker. Seymour wrote several articles for the golf magazines in America including his memories of growing up in North Berwick and watching Ben Sayers Snr. unusual putting action. He wrote in March 1910, Sayers putter head never travelled in the same line as his putts. He always swung it in a course across the line of the putt and counteracted the tendency of the putter face to drag the ball off the true line by setting the putter face slightly to the right of the hole. In matter of fact he putt side spin on the ball which generally resulted in the ball working its way round from the original line of its departure and frequently into the hole. Ben Sayers designed a number of golf courses including Moffat (1884), Rothesay (1892), Nairn Dunbar (1899) Auchterarder (1913); the eighteen hole course at Archerfield and in 1898 Craigielaw Links for Kilspindie Golf Club. In 1898, Sayers was invited by Lord Dunraven to lay out a private course on his ancestral estate at Adare Manor in north-west Ireland. Sayers also laid out a nine-hole course at Ballathie (1914) in Perthshire, and a private course for Lord Lovat in Beauly estate (1910). That year he gave advice to Coldingham and St Abbs Golf Club and laid out the Floors Castle course for the Duke of Roxburgh. Old Ben also laid out a nine-hole course at Robinhood Golf Club at Inchicore four miles south-west of Dublin. In 1926 the club changed it's name to Newlands Golf Club. The last course to be designed by Ben Sayers was at Ford Valley Golf Club, Pathhead, Midlothian. The nine-hole course laid out on land owned by the Earl of Stair was opened for play on 14th June 1924. During this period Ben Sayers suffered from ill-health and his son Ben Sayers Jnr. took over the project at Ford Valley where he played an exhibition match with his assistant Jimmy Black from North Berwick. The course closed at the start of WW2 in 1939. On Monday following the 1901 Open Championship at Muirfield, Ben Sayers travelled to the Isle of Islay to play in an exhibition match at the Machrie Hotel and Golf Links with the Open winner James Braid, Harry Vardon, John H. Taylor and Arnaud Massy for a purse of £100. In 1901 Sayers designed the Castlerock (Mussenden) course in Northern Ireland, and in 1905 he laid out Broomieknowe in Edinburgh. In 1906 he designed the West Monmouthshire course and that year he was invited to layout a course for the Spey Bay Golf Club in Banffshire. Accompanied by Robert Marr from North Berwick, who on Sayers recommendation became head greenkeeper, and with a bundle of red and white flags, they laid out the course - in 2 hours. According to the Banffshire Advertiser, Old Ben would have liked longer but it was getting dark! Sayers joined by his prodigy Arnaud Massy and Sandy Herd played a match at the opening of the course. In 1909, Sayers laid out the municipal course at Craigentinny, Edinburgh. Ben Sayers played with Tom Morris in many exhibition matches at the inauguration of a golf club or the opening of a hotel such as Dunblane Hydro, the Highland Hotels at Crieff, Strathpeffer, Pitlochry and Marine Hotels at North Berwick and Elie. In 1908 Ben Sayers attended the funeral of Tom Morris in St Andrews when his coffin was carried from the Cathedral to the graveyard by six professionals including Andrew Kirkaldy, Davie and Willie Auchterlonie, Jack Burns, Harry Crawford from North Berwick and Sandy Herd. Ben Sayers walked behind as his height precluded him from taking part. Following the procession was Hugh Hamilton from North Berwick who as Links Superintendent carried the Royal and Ancient Golf Club silver club and balls draped in black velvet. Sayers laid out an 18 hole course for Lord Lovat on his estate at Beaufort Castle, Beauly in August 1910. The course no longer exists. In 1911, Ben Sayers was appointed pro at the newly opened Monte Carlo Golf Club, laid out by the Casino Authorities. According to newspaper reports, his appointment was very appropriate as Sayers was known to enjoy a wager. The Monte Carlo course was high up on Mont Agel a thousand feet above the town. Below was the shimmers blue sea with a view of the Riviera from Bordighera to the Esterel mountains beyond Cannes. On the other side there is a wonderful view of the snow-capped Italian Alps. The club house is a veritable palace, the players are to be brought up from Monte Carlo by motor cars and others will come up from La Turbie, the quaint old Roman town on the Corniche road half-way up. At the La Turbie the excellent Hotel de France was put in rediness for golfers. Sayers wintered at Monte Carlo and returned to North Berwick in the spring. The growth in the popularity of golf in Europe can be attributed to Ben Sayers, Arnaud Massy, Tom Vardon, Alex Herd, Jack White and David Grant Jr. Who regularly took part in exhibition matches throughout the continent. By 1912 the number of golf clubs in Europe had increased to; France (42), Germany (19), Italy (10), Belgium (8). During the early part of the century there was an absence of first-class challenge matches, and the public yearned with nostalgia to the return of the golden age. This in turn brought about the first 'old timers or seniors' match, when Ben Sayers (54) challenged Andrew Kirkaldy (51) for a stake of £50, played over 72 holes. In November 1911, an article in Golf Illustrated enthusiastically covered the match, extolling the virtues of such an encounter, and how the two veterans remained faithful to the old traditions, something the younger generation could take a lesson in the manner the golfing duel was fought out. After the first 36 holes at Sunningdale, Sayers was 1 up, and following the second 36 holes at Walton Heath, Sayers triumphed 6 and 5, in what could be said, was the forerunner of today's Senior Tour. At the start of WW1, Ben Sayers was beyond the age of military service, but played in many exhibition matches to raise funds for the Red Cross. One such match attracted hundreds of spectators to the West Links when Sayers played J. Douglas Edgar, the 34 year old French Open champion. Edgar from Gosforth near Newcastle was invalided out of the army and in 1919 won the Canadian Open and that year was appointed professional at Druid Hills G.C in Atlanta, GA. In 1920, J. Douglas Edgar was runner-up in the American PGA championship and the following year he was tragically murdered outside his boarding house in Georgia. George Thomson Sayers born 19th October 1887, at Millhill, Musselburgh. 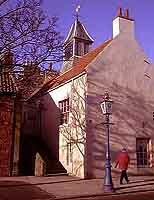 His parents moved to North Berwick and the family resided in a row of pantile cottages at 41 Westgate (now occupied by the building at 47 Westgate). George apprenticed as a clubmaker in the timber building his father erected adjacent to the 18th tee on the West Links, North Berwick. In 1895 George was in charge of a retail shop at 14 Quality Street where he sold golf equipment and in 1905 he moved to 34 Quality Street. George taught Lord Kitchener, the conqueror of the Sudan the game of golf at Archerfield. Kitchener played his first game at North Berwick in September 1910 with his closest friends Mr and Lady Winifred Renshaw of Instow. When Ben Sayers Jnr returned to North Berwick he took over the house and shop in Quality Street when George emigrated to the USA and was appointed club-maker and professional at Merion Golf Club in Pennsylvania. George Sayers contact in America was Rodman E Griscom of Berton, Griscom & Co. Stockbrokers, 40 Wall Street, New York. Rodman Griscom was a founder member of Merion Golf Club in Philadelphia and his sister Francis C. Griscom was US Woman's Amateur Champion in 1900. Francis came to Scotland in 1902 and was tutored all summer at North Berwick by Ben Sayers Snr. In August that year Ben partnered Miss Griscom in a match against Arnaud Massy and British Open Ladies Champion Rhona Adair. The match was halved in front of a large gallery. Frances Griscom was once called 'golf's earliest tom-boy’ and she was the first woman to drive herself to competitions in an automobile. Rodman and Francis visited North Berwick again in 1906 and 1911 and were both under the supervision of Ben Sayers Snr. 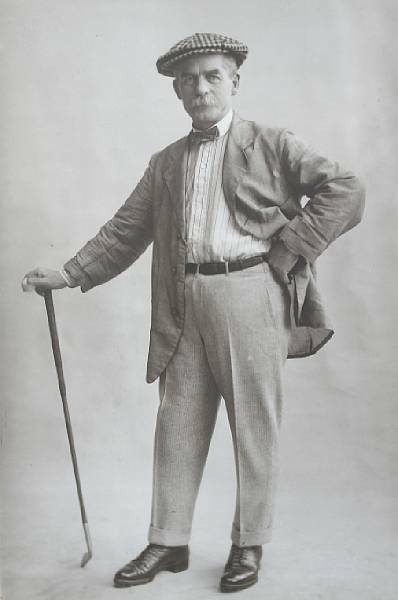 In 1907 Sayers Snr. laid out the course for the Merchants of Edinburgh Golf Club at Craighill Gardens, Edinburgh. In 1905, Ben Sayers was engaged by Dollar Golf Club to layout their new 18-hole course. Sayers was accompanied by greenkeeper Bob Dickson from North Berwick as his assistant. It was reported that Dickson left halfway through the work to take up a post at Portmarnock in Dublin. One of the features of Sayers layout was an absence of bunkers because he realised the natural contours and small plateau greens where difficult enough. The course measured 5242 yards and was opened on 3rd September 1906. Ben Sayers Jnr partnered his cousin Jack White in the London Foursomes Tournament in 1908. Played at Banstead Downs for the Dewar Shield, they defeated the holders Smith and Tingey in the first round. Unfortuately White fell ill and could not play in the final and their opponents Duncan and Mayo offered to postpone the match but the committee awarded them first place. It was Young Ben who came up with the idea of developing a driver with an extra large rounded head, deep faced which was slightly convex, and a whippy shaft longer than standard. Old Ben named the club the 'Dreadnaught' after the little ships lying off North Berwick. Robert Maxwell the amateur champion was given one of the first drivers which he used to great effect winning his second championship in 1909. By then everybody wanted a 'Dreadnaught' and production through 1910 could not keep up with demand. When the groove-faced mashies and irons appeared on the market, the British press protested against the importation of these clubs "from America," because they made golf too easy. 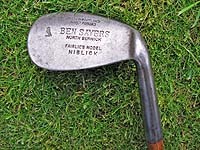 The so-called "American ribbed-faced" clubs-were really invented by Ben Sayers and due to the controversy the sales at home and abroad increased dramatically. In 1914, Ben Sayers and his wife Katie visited their son George in Pennsylvania. They sailed on the Cunard Line from Liverpool on the S.S Lusitania. Crossing the Atlantic took five days and they arrived in New York on 17th April 1914. The following year Sayers planned to return to America and play in the US Open. He reserved a berth on the Lusitania leaving on the 15th May 1915. Although war was raging in Europe, passenger ships crossing the Atlantic had not been attacked. This was to change when the Lusitania was sunk by a German torpedo on May 7th 1915 off Queenstown in Southern Ireland, when 1,201 lost their lives. Many British professionals had reserved a place on the next voyage west on the Lusitania for the purpose of playing in the US Open but Vardon, Ray, Duncan and Mayo cancelled. Despite the obvious risk Sayers decided to honour his business commitments in the USA and travelled on his own. When the ship reached New York, Ben Sayers got himself into a position on the upper deck so he could be seen by the people on the quayside. He knew his son George was among the crowd and Ben started to make a signal by rubbing his chest violently with quick downward strokes of his right hand, just like the old golfing fore-runners would signal their masters that the ball was lying well and on the fairway. Ben's signal to his son was 'All's Well'. Father and son played in the US Open while their family waited anxiously on Ben's safe return to Scotland. This route to the USA was well used by many former Sayers apprentices. James Kelly Thomson was the first to be appointed assistant pro to George Sayers at Merion. He was followed in 1914 by James Gullane , then Jimmy and John Richardson in 1921 and later George Izett joined them. Cyril Goodchild went as assistant to Henry Cotton and Maynard Goldsmith was pro at Royal Cape Golf Club in South Africa. George became a Nationalised citizen of America on 23rd May 1922 at the Court of Philadelphia. He returned to Scotland in April 1924 for his father's funeral in North Berwick. George Sayers died January 1977 at 19468 Royersford, Montgomery, Philadelphia. Read more about the Ben Sayers apprentices who emigrated. Bernard Sayers Jnr. born 13th September 1884 at 41 Westgate, North Berwick. He apprenticed as a club and ball maker in the timber building constructed by his father adjacent to the 18th tee on the West Links. In 1902, the Sayers family resided in Abbotsville, 39 Dirleton Avenue with a permanent cook and house maid. Young Ben married Elizabeth McLagan Vass in 1909 and they resided at 10 Quality Street. Elizabeth's father Alexander Vass was the publican in the Ship Inn 14-16 Quality Street, North Berwick. Ben Sayers Jnr. was pro at Ranfurly G.C in 1905, Cuckfield G.C on Haywards Heath (1906-07), Royal Wimbledon (1908-1912) and Berlin before returning to the North Berwick Burgh course and rejoining his father in the business in 1913. Ben and Lizzie's daughter Doreen Sayers was born in 1911 at 24 West Place, Wimbledon Common. James 'Percy' Pearson from a fishing family living at 11 Harbour Terrace, North Berwick, apprentice as a club maker with Ben Sayers Ltd. and when Ben Sayers Jnr. was appointed professional at Royal Wimbledon Golf Club in 1908 he took Percy Pearson with him to work with six other club makers. By 1911 the call of the sea was too much for Percy and he returned to North Berwick. The Pearson family continue to fish the waters off North Berwick to this day. Young Ben was a member of the PGA in 1902, and played in the Home Internationals between Scotland and England in 1906, 1907, and 1909. 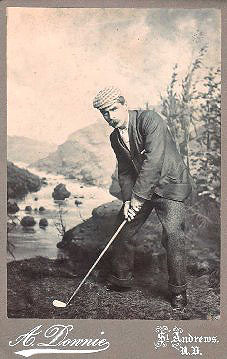 He also entered the 1905 and 1906 Open Championship from North Berwick. In 1920 the West Putting Green was laid out by Ben Sayers Jnr. and Andrew Gilholm, head green keeper on the Burgh course. It was opened on 14th June 1920 and a second eighteen holes came into play in July. Ben Sayers Jnr. taught the Horlicks family to play golf, owners of Greywalls (now a hotel) in Gullane. Katherine Tennant, later Baroness Elliot was also a pupil. In 1923, Ben Sayers was asked to make a miniature set of golf clubs for Queen Mary's Doll's House. Charlie Gibson who was Ben's best-man at his wedding was by then at North Devon Golf Club, he made the irons and Sayers made the wooden clubs. The leather golf bag was two and a half inches high and the clubs were three and a quarter inches long. Gibson's clubmaker Johnny Rowe and Charlie's son Bill Gibson assisted in making the miniature golf clubs using small little screws from a watchmaker. The Doll's House was displayed at the British Empire Exhibition at Wembley in 1924 and is now on view in Windsor Castle. The aim of the project was to raise money for children's charities and Queen Mary wrote personally, thanking the clubmakers. In 1931 Ben Sayers & Son purchased the property at 'Pantiles' 56 High Street, North Berwick. At the same time MacIntyres Lemonade Works behind at 46 Forth Street became available and the clubmakers moved from the West Links to Forth Street where the hand forge was installed in 1934 and the company could now offer left-handed clubs to fill a gap in the market. In 1932 Ben Sayers Jnr and Major Cecil K. Hutchison supervised the alterations to the West Links which included extending the 9th fairway with a new green, forming a new par 3, 10th hole with the tee built on top of the dunes. The 11th hole also with an elevated teeing ground, formed a new par 5, running parallel to the dunes. Sayers in Philadelphia gave Dorothy Campbell a lesson in 1924 when he changed her to the Vardon grip. At 41, she entered the U.S. Women's amateur, and in qualifying shot a record 79, the first woman to break 80 in a national competition in the U.S. Campbell went on to lift the title for the third time. Ben Sayers Snr. died on 9th March 1924 at 131 High Street (formerly 115), and is buried in North Berwick cemetery in Dunbar Road. The Lair is situated on the north wall, with headstone. J.H. Taylor wrote; " Wee Ben was an inveterate and doughty fighter. Nothing and nobody, nor any combination, could daunt his lively fighting spirit. A match need only be suggested, and Ben was found eager and willing to enlist in the ranks, whatever the opposition might be. His small body carried within it an indomitable heart, and he made up for his lack of physique with a great determination and knowledge of the psychology of his opponent which was worth many strokes. He carried a very wise head on his small shoulders." Sayers continued to lease the building at the first tee on the West Links as a showroom with practice nets. He would transfer his best apprentice from the workshop in Forth Street to the West Links shop to demonstrate the new clubs. When Ben received a request from a Country Club in America to suggest a young clubmaker who would be interested in becoming their professional, Sayers turned to the latest apprentice to be moved to the showroom and offered him the position. Many fine clubmakers were trained at Sayers, including Bob Jamieson who was appointed professional at Turnberry and Alex Hay Director of Golf at Woburn and former BBC TV Golf commentator. In 1962, Ben Sayers Ltd was sold to Grampian Holdings, a Glasgow based company while the family retained ownership of the retail premises at 56 High Street until 1965. That year when Ben Sayers Ltd. moved to larger premises in Tantallon Road, the steam hammer transferred from Forth Street was secured in the new factory in a base of concrete, but when it was started up for the first time the concrete shattered and that was the end of hand forging at Sayers. From then on the rough-cast heads were bought in and only ground down, filed and polished in the factory. Ben Sayers Jnr. died 2nd March 1961 and his wife Elizabeth followed him to the grave six months later. The American golfer Doug Sanders was sponsored in the UK by Ben Sayers Ltd. His contract with Sayers agreed to pay a million pounds if he won the Open. During the fourth round at St Andrews in 1970, Sanders had a 30 inch putt on the final green to win, but he missed and tied with Jack Nicklaus. Sanders played well in the 18-hole play-off the following day, but was beaten by Jack Nicklaus. In 1998, Grampian Holdings sold Ben Sayers Ltd. to the Caledonian Golf Group and in 2002 the company was acquired by Tandem plc, a Devon-based sports and leisure equipment buisness. In June 2003 all production of Ben Sayers golf equipment was transferred to the Tandem Group works in Devon, before being moved to China. On a dusty shelve in a dark corner of the ticket office at the East and West Links putting greens lie a dozen old 'Benny Putters', all that remains of Ben Sayers and his family who manufactured golf clubs in North Berwick for over a hundred-twenty-four years. Fortunately the houses where the Sayers family resided remain including the elegant Links House (formally Kileen) 6, Ware Road with its distinctive shade of blue exterior walls from the days of the Sayers family. James C. H. Balmain at 6, Station Road, North Berwick circa 1910. Q Where can I purchase a set of Ben Sayers golf clubs? Q I have an old Benny Putter, do you know anything about the club and how much is it worth? A In the 1920s, the first Benny's were mashie niblicks but later the name became associated more especially with the Benny Putter. This was followed by a version with a ridged base called the 'Gruvesol' putter. It's distinguishing features were the patent Gruvsol and square grip. A centre-shafted version was made when this was legalised and a pistol grip was also added when passed by the committee of the Royal & Ancient Golf Club. The many players who chose to use the Benny Putter included five times Open Champion Henry Cotton and Prince of Wales, later Edward VII. 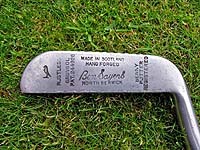 The Benny Putter was manufactured between 1930 -1955 in Ben Sayers workshop at 46 Forth Street, North Berwick. The 'Gruvsol' registered design No.718956; Steel shaft reference No. 924; Hickory shaft No.925 and Centre shaft No.926. The square grip was made from cork, rubber composition or calf skin and available in any length, lie or weight. At auction a Benny Putter could fetch upwards of £95. Copyright © Douglas C. Seaton 2018, All Rights Reserved.